PlayStation 2 (PS2) Network Access Disc. Condition is New. Dispatched with Royal Mail 1st Class. Item Pictured Is Item You Will Receive. in Good Condition. This adapter does not have the network function. Only used to connect a SATA HDD. Can support up to 2TB 2000GB SATA HDD 2.5" and 3.5". Interface: SATA interface. Works with most SATA hard-drive's (Upto 2TB). Disc in good condition, appears unplayed. Official Sony Playstation 2 Network Adaptor with Network Access Disc . Condition is very good, used. 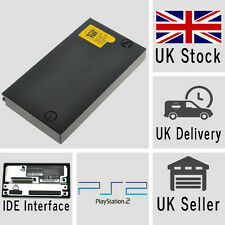 Brand New Sony PlayStation2 PS2 Hard Drive Adaptor (SATA) Sony PlayStation2 PS2 SATA Hard Drive Adaptor Brand New and boxed unit by Gamestar. Allows you to connect a SATA hard-drive for use on the Sony 'fat' PlayStation 2. These are brand new and never before used units. Perfect for running Free Mcboot (FMCB) and using a program such as HD-Loader or OPL in conjunction with your own SATA hard-drive. Please see my other auctions for Mcboot Memory Cards. Adaptor Features:. Bushey Hall Lane. Sold as seen, what you see is what you get. SCEE HITS DEMO in blue sleeve. PLAYSTATION 2. 5 official sony discs. NETWORK ACCESS DISC manual. 1 SATA Interface Hard Disk. With a SATA HDD interface. Only used to connect a SATA HDD and to play from HDD without discs. Allows you to connect a SATA HDD, 2.5" or 3.5" in varies capacity: 40GB, 80GB, 120GB, 160GB, 320GB etc.